BRAG's Patti Horsnell inspects the clothing donations. All passed muster! 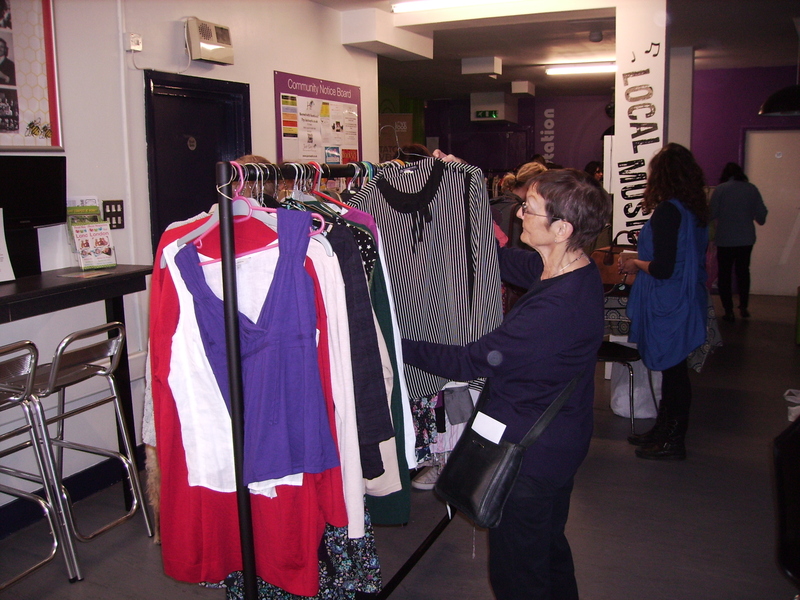 If you’re wondering why a friend has suddenly turned up with some nifty new outfits, it might be because she attended BRAG’s first-ever swishing, or clothes swap, event at Docking Station on Brentford High Street on Saturday. Even before the doors opened at noon, people were lined up outside with donations of good, clean women’s clothing to exchange. In total, 215 items were collected, including jackets, trousers, woollies, designer dresses, eveningwear, accessories, and even a fascinator, which its new owner says will go to two weddings this summer. The “taking” part of the give-and-take event started at 2pm, and in the next two hours about 30 people replenished their wardrobes with clothes that others had grown tired of, grown out of, or had simply decided they didn’t need any more. Docking Station’s cafe did a brisk business, providing sustenance for people who wanted to rest and chat after their retail therapy. A number of people asked when the next swishing event would take place, with some saying they would like to see swishing in other parts of the borough. So watch this space. Many thanks to West London Waste, who were partners in the event and provided invaluable support in the form of staff and other resources. We hope they enjoyed the event as much as we BRAGgers did. And if the idea of hosting your own swishing event appeals, please contact West London Waste or BRAG for further details. This entry was posted in Events and tagged Brentford, clothes-swap, docking station, swishing. Bookmark the permalink.